I wanted to tie the theme from my invitations over to my party table settings. 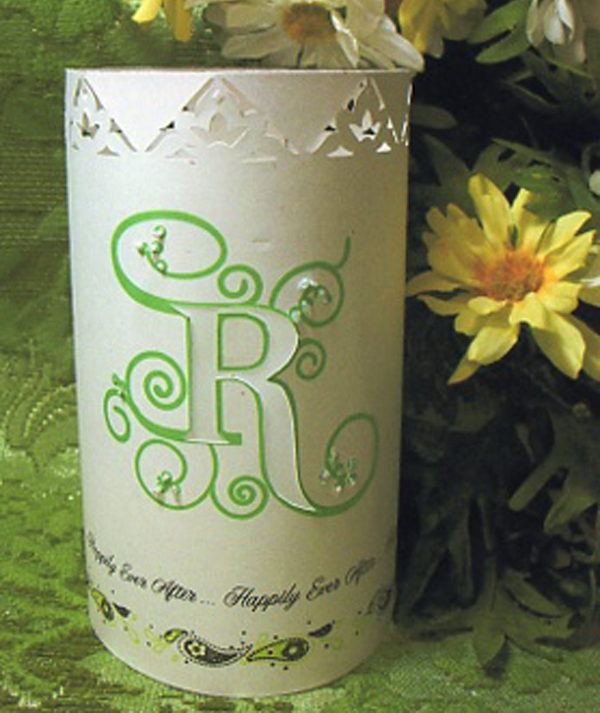 Since this was an evening party, I thought luminaries would be a nice touch to add a glow to a magical night. I printed the large letter “R” using the Duetica DT Woodwynds font, and added the “Happily Ever After” sentiment at the bottom using the DT Mandolyn font. Using a craft knife, I cut the widest areas of the monogram out, leaving some of the printed ink color around the border. I then adhered the vellum behind the cut out, and rolled the ends together securing with super sticky tape. Finally, I just had to add some stickles to the dots on the this wonderful font to add to the sparkle of these charming luminaries. This entry was posted in Design Team, Inspirational Ideas, Party and tagged decor, Design Team, Duetica Lettering Arts Studio, Fonts, home decor, party, wedding. Bookmark the permalink.